If you’ve been reading my blog and/or magazine column for a while, you might have noticed that I like to do things a little differently. These cookies are a good example of this. Sure, I would have just made blueberry muffins, but where’s the fun in that? So instead, I created blueberry muffin cookies. They’re quite unusual, I must say. They look like ordinary cookies, but you taste them, and suddenly you are tasting a muffin. Weird? Cool? Awesome? I think all of those! If you’re looking for something completely different, totally delicious, yet seasonal and fresh, this is the treat for you! I originally developed this recipe in the winter, so I came up with a way to use frozen blueberries, when fresh aren’t available, if needed. Follow the directions carefully. If using fresh blueberries, just stir them into the dough very gently. Preheat oven to 375. Line a cookie sheet with parchment paper or grease lightly. Set aside. If using fresh blueberries, skip the first step. *For frozen,leave blueberries to defrost completely, at least a couple of hours. Once defrosted, drain out all of the accumulated liquid. Squeeze lightly to drain as much liquid from the berries as possible. 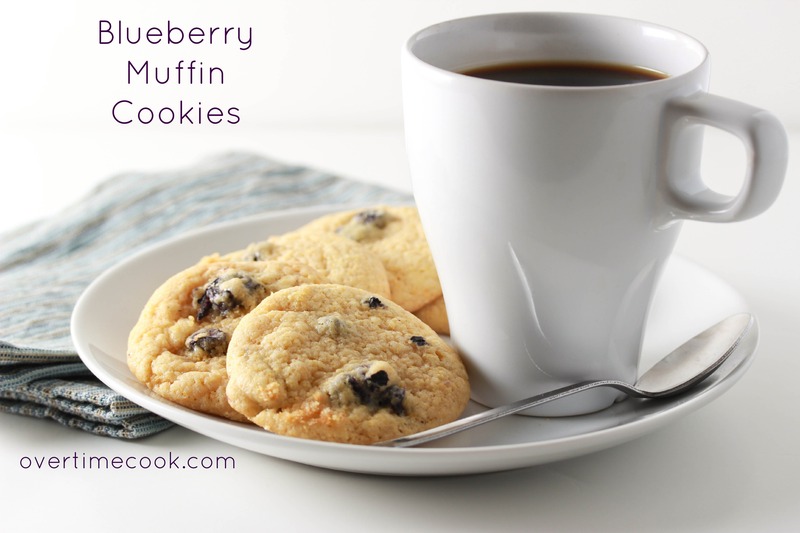 Toss the blueberries with 2 tablespoons of flour and set aside. In the bowl of an electric mixer, cream together the margarine, sugar and brown sugar until smooth. Add the milk, vanilla extract and eggs, one at a time, beating well to combine after each addition. In a separate bowl, whisk together the flour, corn meal, baking powder, baking soda and salt. With the mixer on low, slowly stir the dry ingredients into the wet mixture in the mixer. Beat until just combined. Stir in the prepared blueberries, very gently to prevent the colors from running. Using a medium cookie scoop (or a heaping tablespoon) scoop the dough onto the prepared cookie sheet, leaving room for spreading. Bake the cookies at 375 for about 11 minutes, until the tops appear set. These look and sound delicious. What a great idea! Interesting idea, one to try! This is going in my recipe box!! Lovely photos too! So, basically…I can have cookies for breakfast? SOLD! Mine spread over the pan and became basically flat. Any suggestions? You can try adding a bit more flour. Best cookies ever!!!! Plan on making them regularly! You’re right. I was subbing spelt for wheat and usually it needs a bit more flour. In this case I doubled it and they came out great! Definitely a keeper! This looks great, kind of reminds me of the best bit of a muffin, the top! If I want to actually make muffins what do I need to change in the recipe / cooking time ? I wouldn’t recommend that. I have a blueberry muffin recipe you can use instead. Can I get the recipe? It’s in my archives. Check the index. Can i substitute applesauce for some of the butter? You can try but I can’t guarantee anything…I never tested it that way. Is there a way to change the corn meal, its the only thing I don’t have. The corn meal gives the cookies their taste and texture. If you don’t have it, I would recommend using one of my other cookie recipes. Your blueberry muffin cookies are delicious. They tasted like muffin tops!! I made a delicious addition, I chopped a small bar of dark chocolate and added to the batter. Hi Miriam, my name is Chavie and in sincerely appreciate all that you do to bring deliciousness to my table. I purchased your cookbook, Something Sweet and it is one of my favorites. I do have a question with regard to the Blueberry Muffin cookie. In the list of ingredients, the first item is 3/4 cup oil. In the directions, However, it stipulates to cream butter and sugars. Based on your online recipe, I believe I should be using butter. Kindly advise and/or confirm! Happy baking! The cookbook version was adapted to work with oil. The butter in the instructions was an error that was corrected in the later editions of the book.